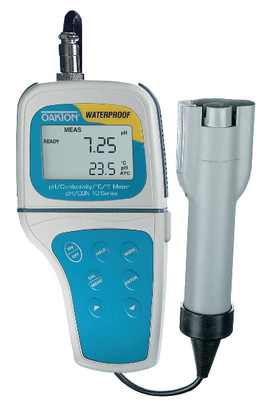 Measure pH, conductivity, and temperature with one meter and probe. This waterproof meter features an advanced design and will even float if dropped into a pond or tank. Fast response time is just one of many user-friendly features in this versatile meter - it also switches from conductivity to pH readings with a button press, features a dual display of pH or conductivity plus temperature, and provides auto-buffer recognition for pH calibration. The replaceable multi-sensor probe comes with 10 ft submersible cable, meter, probe, calibration pouches (3 each pH 4.01; 7.00; 10.00; 2 each conductivity 447 μS; 1413 μS; 2764 μS; 15,000 μS), 3 rinse water pouches, sample bottle, carrying case, and four 1.5 V AA batteries. Specifications: pH range: 0.00-14.00; resolution 0.01 pH; accuracy ± 0.01 pH; Calibration: 3 points (pH 4.01, 7.00, 10.00). Conductivity range: 0.00 -19.99 muS, 0.0-199.9 muS, 0- 1999 muS, 0.00-19.99 mS; resolution 0.01 muS, 0.1 muS, 1 muS, 0.01 mS; accuracy ±1% full scale. Temperature range: 0.0-100.0°C; resolution: 0.1°C; accuracy: ±0.5°C. Size: 7 " x 3 " x 1 "; weight: 1.3 lb.